When Uma Bharti’s Ganga cleaning programme comes into being will they fish him out? Mr. Kashikananda Giri, 90, who died in a regular hospital, not Mr. Ramdev’s divine Patanjali Chikitsalaya, has been interred in River Ganges in a holy packing case. 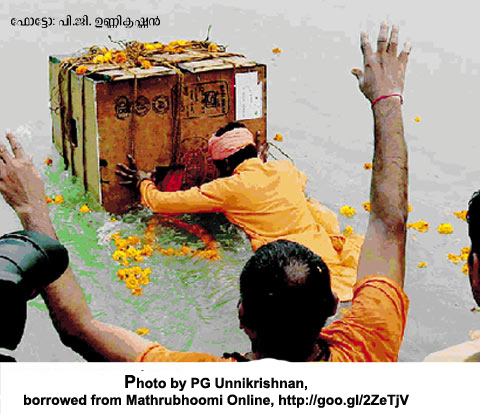 Once again all the dead babas, Anandas, Giris, Maharajs and Swamies can be put into the holy river. Dead old grandfathers (please, not this one) can soon follow, just as many smaller gods are following Shivsena’s Ganpati into lakes and rivers. Mother Ganga can once again become the longest floating graveyard of the world. Guinness, are you listening? Many years ago I used to drive my family to Haridwar for bathing in the cool Ganges waters there – they for salvation, I for the sheer joy of walking on the sand-and-gravel river bed while fighting the current that would be trying to sweep me away. Never again. What if I step on the rotten remains of a sacred Baba? Anandas, swamis, Giris, Maharajs polluting Gang Ma…. priceless de-composure! Nice to see you here, Robert. Warm welcome!